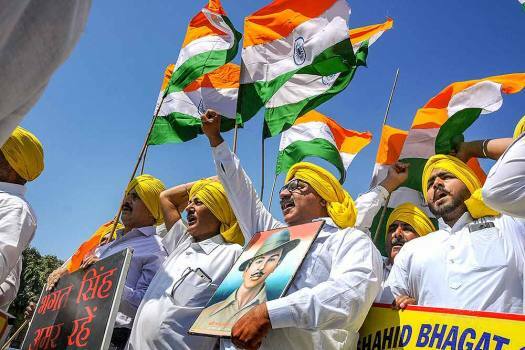 All-India Anti-Terrorist Front (AIATF) raise slogans as they take out a rally on the eve of the death anniversary of Bhagat Singh at Jallianwala Bagh, in Amritsar. 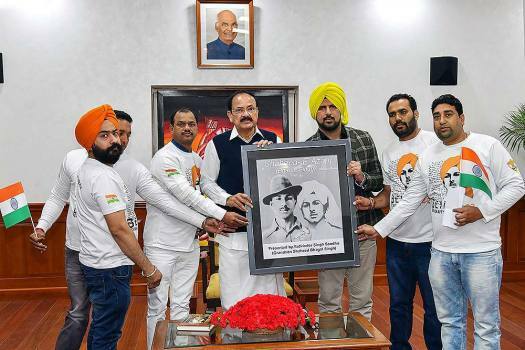 Vice President M Venkaiah Naidu receives a reprint of Shaheed Bhagat Singh’s original photograph, from the members of Bhagat Singh's Brigade, in New Delhi. 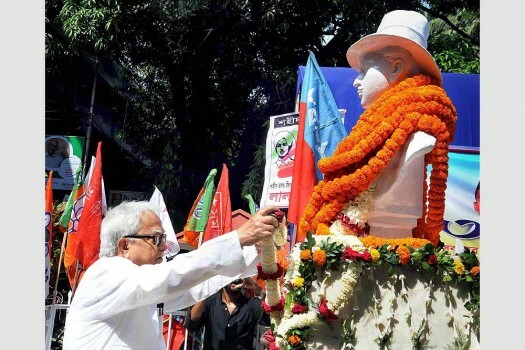 Left Front Chairman and CPI(M) politburo member Biman Bose pays tribute to freedom fighter Bhagat Singh on the occasion of 'Martyrdom Day', at Bhagat Singh Uddyan, in Kolkata. People, along with All India Anti Terrorist Front, taking a vow to safeguard the nation on the eve of death anniversary of Shaheed Bhagat Singh at Jallianwala Bagh, in Amritsar. 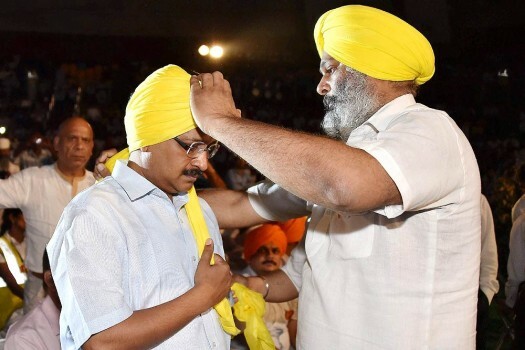 Delhi Chief Minister Arvind Kejriwal is tied a turban during a programme on 110th birth anniversary of Shaheed Bhagat Singh, in New Delhi. 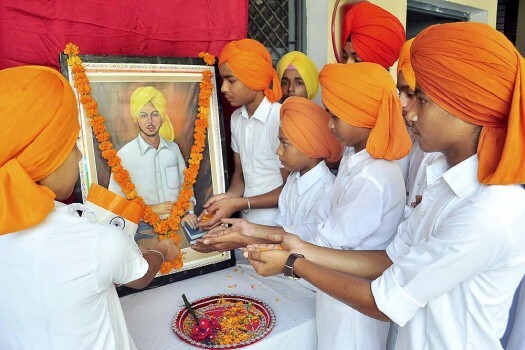 School students pay tribute to Shaheed Bhagat Singh on his birth anniversary at a School, in Patiala. 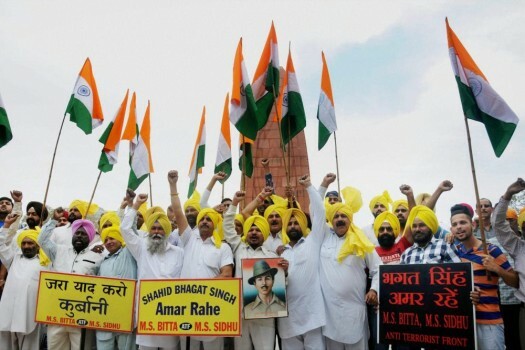 All India Anti-Terrorist Front members raise slogans on the martyrdom of Shaheed Bhagat Singh at Jallianwalan Bagh in Amritsar. 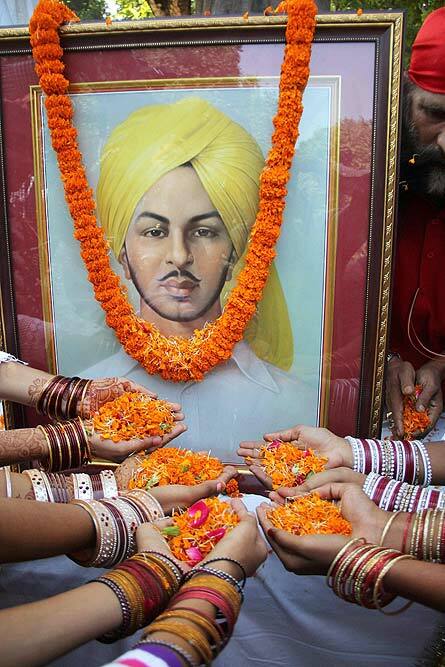 People pay homage floral tributes to Shaheed Bhagat Singh on the occasion of his 108th Birth anniversary at Company Gardens in Allahabad, Uttar Pradesh. 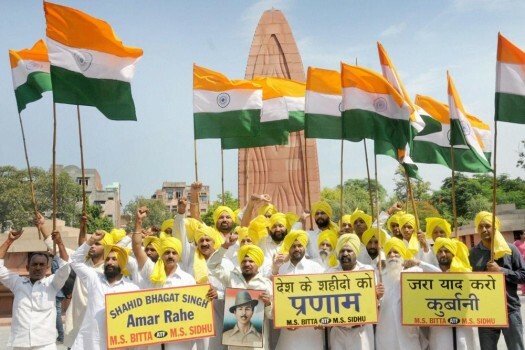 All India Anti Terrorist Front of raising patriotic slogans and paying tributes to Shaheed Bhagat Singh on his 108th birth anniversary at Jallianwala Bagh in Amritsar, Punjab. 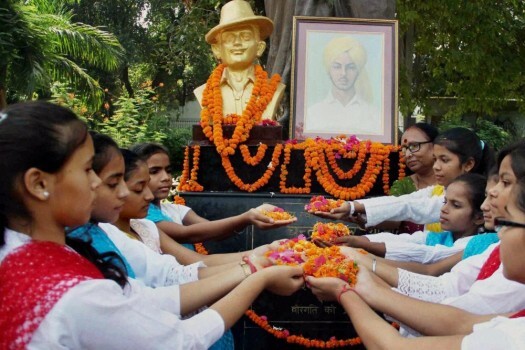 Young girls pay floral tributes to Bhagat Singh at Company Garden in Allahabad. 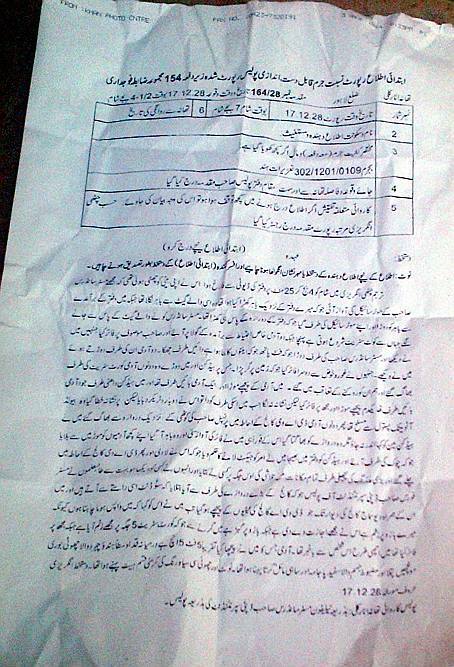 Copy of FIR of the murder of British police officer John P Saunders filed by Lahore Police in 1928. Bhagat Singh was hanged in 1931 for allegedly killing Saunders in Lahore. 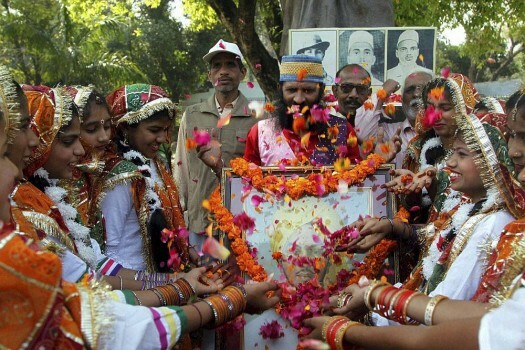 School girls paying tribute to pictures of Shaheed Bhagat Singh, Shaheed Sukhdev and Shaheed Rajguru, on their death anniversary in Allahabad. 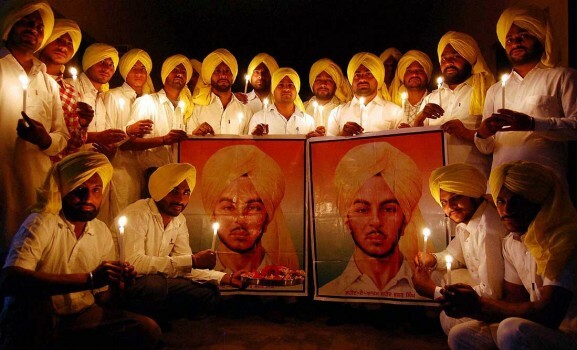 Members of Shaheed Bhagat Singh Club hold candles to pay tribute to Shaheed Bhagat Singh on the eve of his martyrdom day in Patiala. 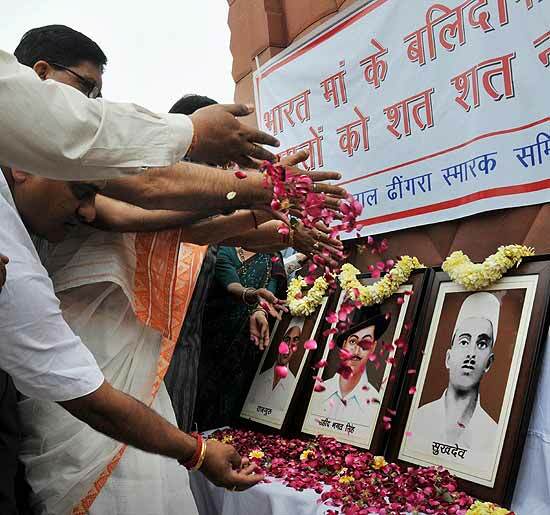 People paying tribute to Shahid Bhagat Singh on the occasion of his birth anniversary in Allahabad. 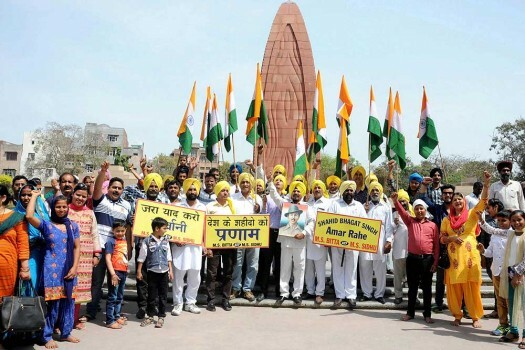 People paying tributes to freedom fighters Bhagat Singh, Rajguru and Sukhdev at Jallianwala Bagh on the occasion their martyrdom in Amritsar. 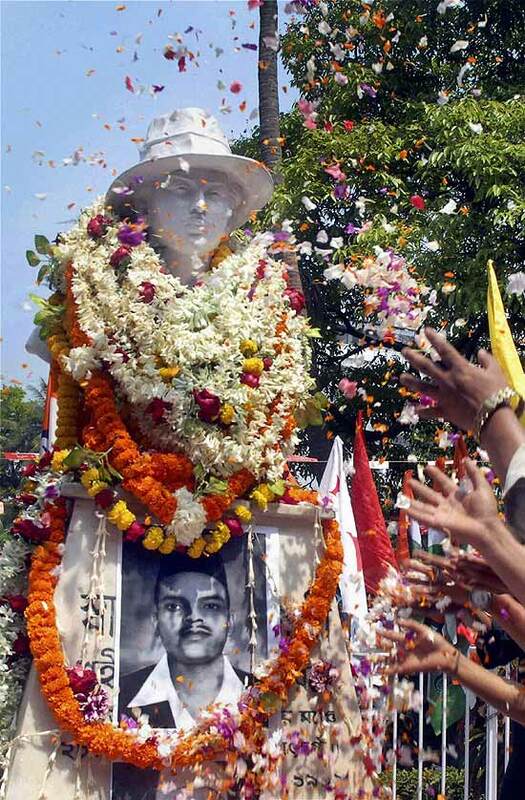 People pay tributes to Shaheed Bhagat Singh to observe his martyrdom in Kolkata. 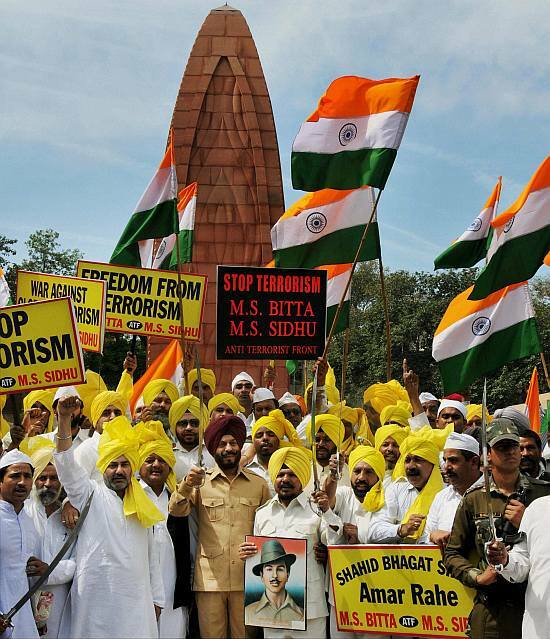 All India Anti Terrorists Front President M S Bitta raise along with other members at the Jallianwala Bagh on the eve of the martyrdom of Shaheed Bhagat Singh in Amritsar. 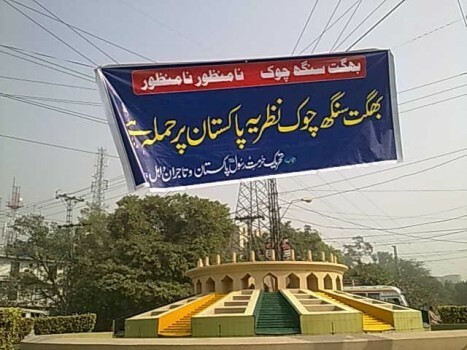 Shadman Chowk in Lahore is now BHAGAT SINGH CHOWK. 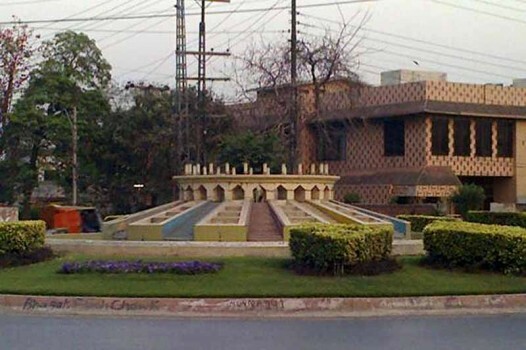 The roundabout was the site of the erstwhile Lahore jail where the freedom fighter and revolutionary was hanged in March 1931. Members of the JKNPP enact the hanging of freedom fighters Bhagat Singh, Sukhdev and Rajguru to commemorate their 80th Martyrdom Day in Jammu. Modi's campaigning for the BJP against the ruling Congress party in poll-bound Karnataka was found to be riddled with factual inaccuracy. 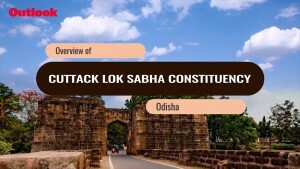 The book, written by former RSS pracharak and journalist Narender Sehgal, claims that Rajguru, who was sent to the gallows along with Bhagat Singh and Sukhdev in 1931, was a Sangh "swayamsevak"
The Bhagat Singh Memorial Foundation (BSMF) and the Bhagat Singh Foundation Pakistan (BSFP) demanded that he be declared as a "national hero" of Pakistan. 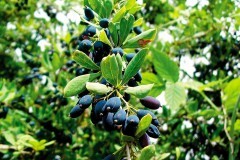 He said the decision to expel Khan for a period of one year was taken by the college's staff council. 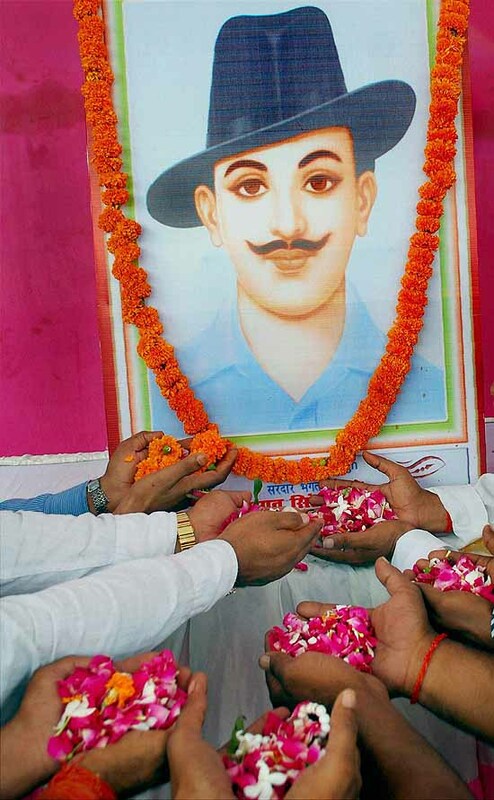 "Bhagat Singh is our hero and is entitled to be bestowed upon the greatest medal of gallantry (Nishan-e-Haider) like Maj Aziz Bhahti who also wrote on the bravery Bhagat Singh and declared him his 'hero and ideal'." Advocate Imtiaz Rashid Qureshi filed a fresh petition yesterday in the Lahore High Court for the early hearing of his case to prove Singh's innocence. The Indian Law Journal claims that all the witnesses had been coached and that Bhagat Singh had put the gun on a table before surrendering. Devgan-Deol certainly fail in rewriting history, even at the box-office.